Until now quality single side band receivers have only been available at high cost. 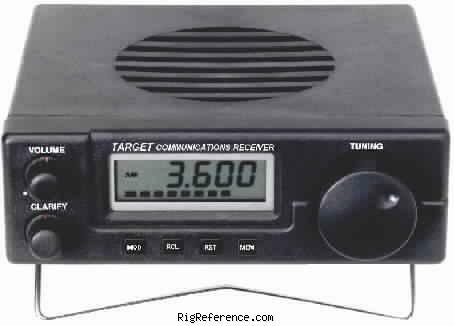 The Target HF3 is a masterpiece of R.F.Engineering covering the entire spectrum between 30Khz to 30Mhz. For those new to single side band reception the unit comes complete with everything needed to "get on the air" including a very comprehensive instruction manual which includes a list of useful marine frequencies. A button on the front of the receiver changes reception mode, from a narrow filter for SSB reception to a wide filter which enables high quality audio signals to be heard from broadcast stations around the world. The large, clear liquid crystal display shows the precise frequency tuned to and there is no need for constant "correcting" with the tuning knob so often associated with SSB signals as the receiver if fully synthesized. The HF3/W version of the receiver is as the standard Target HF3(/P) but with the addition of a weatherfax interface, together with cable to connect the receiver to a PC and weatherfax software. Simply install the Windows based software, plug in the receiver output to your PC and receive weatherfax pictures from around the world. You can even store and print the maps out if you wish. The software enables reception of weatherfax pictures, Radiotelex weather forecasts and Navtex. Also sold as NASA Target HF3 and Lowe SRX-100. Estimating the value of a rig can be challenging. We collect prices paid by real hams over the years to help you estimate the current value of the AKD HF3. Just bought or sold this model? Let us know what you traded it for and help other ham operators!